The fact that this post is coming a few days before Halloween is timely, but not related. I don’t mean “haunting” in a ghostly kind of way. Though, if you think you are being haunted by a ghost, you may have a problem on your hands. I mean “haunting” as in: what is the one thing you never tried to accomplish, or keep failing to, that keeps you up at night? If something immediately pops into your head, it’s that thing. When I was trying to figure out what I was going to commit to this year, I had lots of ideas. Write another novel, write a full screen play, eat ALL the ice cream. You know, just really important endeavors I hadn’t gotten around to (except the ice cream part, which I always manage to make time for). But something has been haunting me ever since last February: The Warm Fuzzy Project. Last year, I started the project as a way to thank everyone who joined NoExNo and inspired me to accomplish my goals. I had the postcards made and even set up the website, only to send out a little less than half of them. I was disappointed and frustrated with myself that I didn’t follow through with the project to the end or try to grow it further. In fact, if I had spent the amount of time I did stressing about it as I did working on it, I would have made some progress. Instead, I continued to feel like I had failed and did nothing about it. So, when it was time to make this year’s goal, I decided that I didn’t want to be haunted by the Ghost of Unfinished Business any longer. That’s why I have committed to finishing the project. 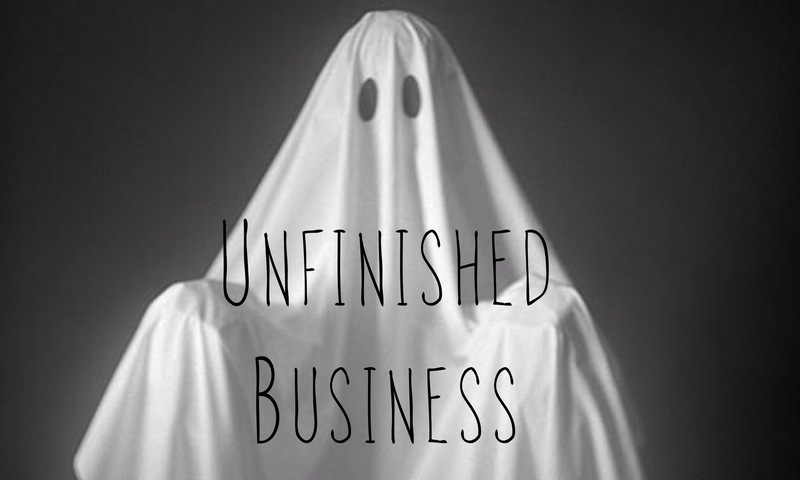 What unfinished business is haunting you? Chances are, you already know what you want to commit to for NoExNo. So, what’s stopping you? Ready to commit? Add your goal now! I start a lot of things and don’t finish them. It’s kind of amazing how little self discipline/control I seem to have when there is no external structure pushing me along. I keep hoping that motivation might fall from the sky, and during these wishful times, I fall into paralyzing anxiety. This year, it seems like it’s time for me to grow up a bit here, and be a friend to myself. I’m using this month to build in a structure of activities that I know set me on the right track if I actually do them. Having attempted a few times and given up due to constantly falling short of my own lofty expectations, it’s probably the hardest thing I’ve ever done (sorry grad school!) So ya, just in time for Halloween, I am very glad to be here to confront my inner ghouls!